Sure it's balmy out there right now. Just a light jacket is all you need on the morning stand and most evenings it's too darn hot for deer hunting until the sun settles low. But as sure as the whitetail will rut in another month or two, you can bet that all-to-soon colder weather is going to arrive. Of course serious whitetail hunters like the cold. I've always found that deer move better in cold weather than they do when the weather is warm. Colder weather means that deer must spend more time feeding to keep their internal furnaces stoked. That means that there is a good chance that I can intercept that buck as he makes his way to or from the food source, or in the case of browse or mast especially, at the food source itself. 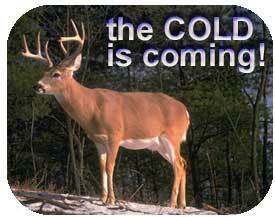 During the rut, I pray for cold weather. Sure the rut goes on the weather be damned, but the best daytime rut action takes place during cold weather. 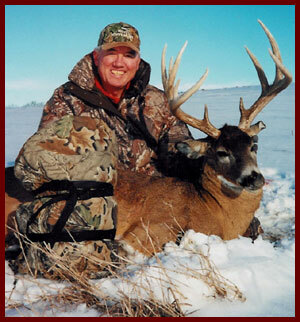 Many hunters will recall that the whitetail rut action of 1998 and 1999 were stymied by very warm temperatures. What happens when it is unseasonably warm during the rut, is that all of that hanky-panky we depend upon to put a buck in our sights takes place at night when it is cooler and the bucks, all decked out in their heavy winter coats, just lay around in the shade most of the day feeling sorry for themselves. The weather came back to normal during the fall of 2000 and with the cooler weather during the rut the action was hot and heavy. Some mighty impressive bucks were taken during the whitetail rut of 2000. The trick in cold weather of course, whether you are talking about late-season hunting near food sources or hanging out over a scrape line or a favorite funnel during the rut is to tough it out on stand long enough to let it happen. Frozen fingers, numb toes and just plain cold, have forced more deer hunters to prematurely give up on good stand locations than all other reasons combined. Tens of thousands of deer each year owe their lives to the fact that hunters were not on stand when the deer walked by because the cold had forced the hunters to vacate their positions. I don't know a single deer hunter, whether from Michigan or Mississippi, who has not been forced from a stand because of being too cold. It used to happen to me too, but it does not anymore. It does not ever have to happen to you again either. The solution is a very simple cold weather garment called the Heater Body Suit. The Heater Body Suit weighs only six pounds and rolls up into a compact bundle which I carry into the stand with me using the built-in backpack straps. I dress in light clothing for the hike into the stand so that I do not get sweated up. Once you are lathered in sweat, your odds of staying put on stand in cold weather are somewhere between slim and none. At my stand site I slip on the Holofill insulated booties right over my hunting boots, step into the Heater Body Suit, zip it up and with the addition of a warm hat and full face mask I am impervious to the cold. No wires to worry about kinking or breaking, no batteries to go dead, just your own body heat trapped in a whisper-quiet yet windproof shell with ten ounces of Hollofill insulation and comfy, noise-free chamois lining. Pretty slick. When I see a deer coming, thanks to the internal shoulder straps and the ultra-quiet zipper, I can easily and silently slide the suit off of my shoulders. I've worn the suit while gun hunting and bow hunting and have never had it interfere with my ability to get a shot or make a shot. But I know this, without my Heater Body Suit, in many cases I would never have been there to take the shot anyway. The Heater Body Suit comes with a very simple guarantee. You stay warm or your money back. Phone (920)-565-3273 or check them out on the Internet at www.heaterbodysuit.com. Gary Clancy was able to tough it out without loading up on bulky clothing - a factor which allowed him to shoot this nice buck.